We met from 11:00 a.m. to 5:00 p.m. on May 9, 2015. After much magical and practical activity, the meeting ended with two proposals that were enthusiastically consensed upon with much dancing. A self-selected working group of at least five people, who will function as a temporary board of the Upper Mississippi Valley Reclaiming Community, are empowered to determine how to get an EIN as a religious organization, select the institution and open a financial account by summer solstice with community input and feedback ending on June 1. Working Group: Bird, Diane, Paul, Song, Teri. Working Group: Alex, Johannah, Karin, Song. This list of shared elements from the group visioning, including a word cloud, in which the most frequently used words are larger than those words used less frequently during the share. a giant cauldron in middle of circle of witches filled to the brim, constantly fed and stirred. Brew is color of money and shifts based upon who is stirring and who is adding to brew. A big communal cauldron. we are a spiritual community that hosts various rituals such as naming, birth, death, meal trains, healing. maybe made up of a multitude of intentional communities. 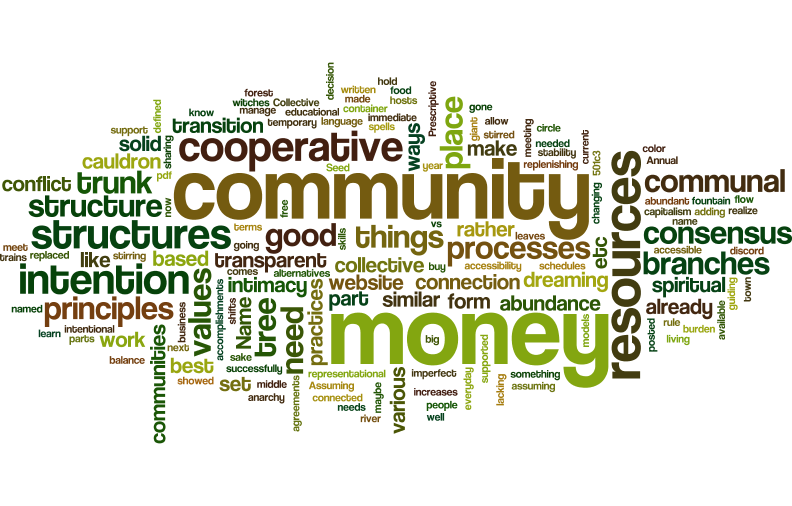 Collective abundance, collective processes, there is connection and growth and intimacy in negotiating everyday needs, including money and resources.